Sorry this is late. I am posting it from a cafe in Montpellier (the place in France, not the Vermont state capital). I got a question on facebook asking what the breeder’s equation is. 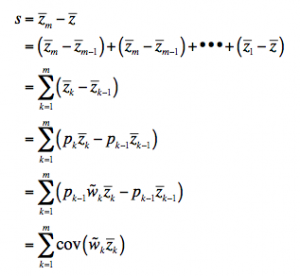 This is a little embarrassing since I have been acting as if everybody obviously knew this equation, when in fact, only those who have studied quantitative genetics can be expected to be familiar with it. I will first discuss the original form of the equation that considers only a single trait. Next week I will talk about the multivariate form of the equation. Thus, without further ado, the breeders equation. . . 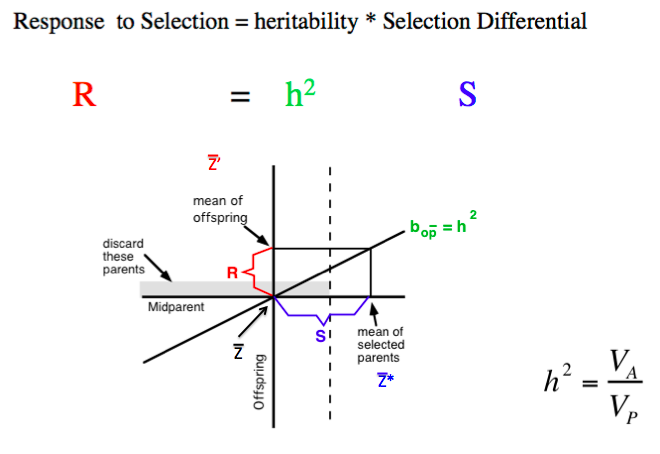 Here r is the response to selection, h2 is the heritability and s is the selection differential. Lets take these elements one at a time. 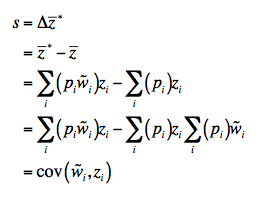 Using this notation it becomes clear that is the frequency after selection, and again reminds us that s is the covariance between a trait and relative fitness. Again, I refer you to last weeks post for a numerical example. One of the big and obvious issues with this is defining fitness. At one level “fitness” is a nearly metaphysical term for something that is really impossible to measure. Any one definition that you can come up with has a counter example. For example, lifetime reproductive success is often given as a measure of fitness, but one only need raise the example of the “grandchildless” mutations in both Drosophila and Caenorhabditis (I suspect they are actually mutatations in different genes). Females that have this mutation have normal fertility, but their children are sterile, and one would thus have to say that they had a fitness of zero. In words, this is saying that fitness can be divided into a series of episodes. Thus, for example, you might have “survival to first molt”, “survival to second molt given that you survived the first molt”, etc.. Note that to make the fitness components multiplicative, one simply needs to make them conditional. Thus, “survival to adulthood” and “mating success” is not multiplicative, but “survival to adulthood” and “mating success given that you survived to adulthood” would be. The way that this saves us is that we can simply admit the impossibility of measuring total fitness in nearly all circumstances. Instead we measure one of these episodes of selection, and call the appropriate fitness component “fitness”. Thus, we can use the total number of seeds produced as a measure of reproductive success even though we don’t know how many seedlings died before the first census. There are two caveats that need to be mentioned here. First, since we are not measuring total fitness we need to be aware that selection during another episode may be countering the selection we measure. We may find that bigger male frogs have greater mating success indicating that sexual selection is favoring larger males (this is what Arnold and Wade found), and ask why it is that that male frogs are not huge. Perhaps unknown to us is that survival selection favors smaller individuals that are less likely to starve, and it is this counter selection that keeps the giant killer man eating frogs at bay. The second issue is that this assumes the selection episodes are independent. If they aren’t there are a whole bunch of cross-products that make the results ugly. To see where this might happen, imagine you are in a pair of back-to-back foot races. Clearly, if you run hard in the first race, you will have a better chance of winning the first, but may be too exhausted to perform well in the second. Thus, the two races are not independent. There is no very good solution to this second problem other than to be aware that it may complicate your results. In any case, to repeat myself yet again, selection is quite measurable in natural populations, and even though we cannot measure total fitness, we can still do good biology by settling for working with fitness components. The second term is the heritability. 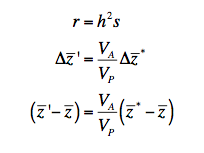 This is a formal term, and is the ratio of the additive genetic variance to the phenotypic variance. Additive genetic variance was originally defined by Ronald Fisher to be the covariance between the average effect and the average excess, so this becomes the formal definition. It is also unmeasurable, and frankly not useful. For practical purposes the additive genetic variance is the variance that can be passed from parent to offspring. Basically, every individual has a “breeding value”, which is the trait value of their offspring when they are randomly mated in the population. To reiterate, it is not what an individual looks like, it is what their offspring look like. This leads to the rather odd point that, for example, bulls have a breeding value for milk yield, which is the amount of milk their daughters produce. The offspring of a pair of parents is expected to be the average of the breeding values of the two parents, but of course for any particular offspring it will vary from this expectation. For our purposes, the important thing is that the variance in breeding values is, at least for our present purposes, equal to the additive genetic variance. There are many ways to measure additive genetic variance, all involve some sort of comparison of relatives, such as parent offspring regression or a comparison of sibs and half sibs. For our story one is worth mentioning, that is the regression of offspring on “midparents”. 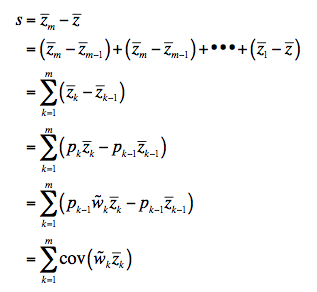 In this method a regression is done of the value of the trait in the offspring against the mean of their parents . This does not measure the additive genetic variance per se, but the slope of this regression is equal to the heritability. The phenotypic variance is simply the variance of the trait in the population. That is the classical breeders equation. This can be seen very nicely using a graph I put up earlier. In this figure the regression of offspring on mid-parents is the heritability (I will clean this up later. I modified it while on a plane). From it you can see that the slope of the regression line “translates” the change in the mean of the parents into a change in the mean of the offspring. This figure suffers mainly from the fact that the offspring are variable, thus, there should be a distribution around the regression line. The last thing to add is that I am presenting an argument for a phenotypic view of evolution. The important thing about the breeder’s equation is that it tends to work, and it works well, at least for short periods of time. However, Fisher developed this using the assumption of a specific underlying model of additive gene action. 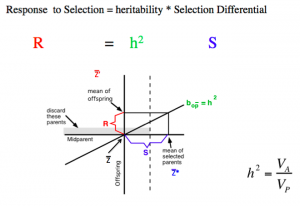 To allow for non-linearities and the possibility of inheritance of factors other than purely parentally inherited genetic factors the classic breeders equation should probably be modified to allow a more generic function for the transition equation. Thus we might write it as r = g(s), that is the response to selection is an unspecified function of the selection differential. In most cases multiplying the selection differential by a constant between 0 and 1 (i.e., g(s) = h2s) will probably give a pretty accurate prediction. This entry was posted on Saturday, July 6th, 2013 at 1:31 pm and is filed under Uncategorized. You can follow any responses to this entry through the RSS 2.0 feed. You can leave a response, or trackback from your own site.